Beyond the Sunset Theatre Production | TMC | Toki Mabogunje & Co.
On September 24th and 25th, 2016 at 06:00PM, the Beyond the Sunset Theatre Production will be performed at Freedom Park, Broad St, Lagos, Nigeria. 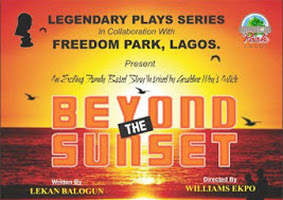 The Legendary Plays Series, in collaboration with Freedom Park Lagos, presents Beyond the Sunset. A production inspired by Geraldine Wey’s Article; Written by Lekan Balogun; and Directed by Williams Ekpo.